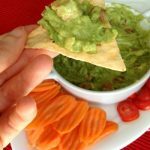 DIY Guacamole Seasoning Blend for one large avocado! Double, triple, or quadruple as needed! You can even make a big batch to keep on hand for all your future guacamole needs! Combine all ingredients and add to your avocado. Mash away! See post for my go-to guacamole recipe.